Copyright 2016 Haunted Play LLC / Unbound Productions. Over the past few weeks I’ve been reviewing as many of the local Halloween haunts in the Los Angeles and Orange County areas of Southern California as possible, and the results have been extremely positive. I’m pleased to say none of the haunts I’ve visited have disappointed me in any significant way. All were at the very least fun and each displayed the passion and care of their creators, which is the bare minimum requirement for independent productions like these, in my book. It seems people who take the time to put together a Halloween event on their own time tend to embrace what they are doing, and make a point to do it well. With that said, there are two productions that I experienced this season that take that care and passion and elevate them to the next level. 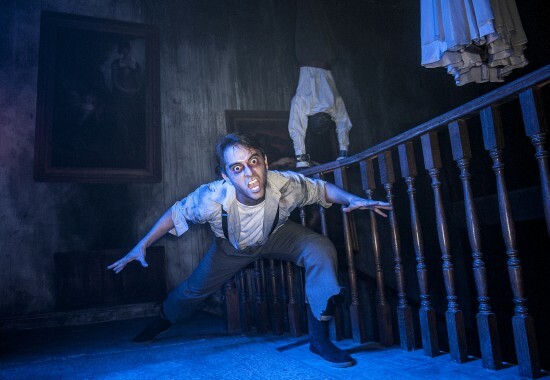 Both fall into the category of “immersive theater,” both are a short driving distance from central L.A., and both make such an impression on me that I’ll be recommending them to everyone I encounter who wants to experience the best of what Halloween in Los Angeles has to offer. The first of these two is called “Delusion: His Crimson Queen.” Delusion has been running since 2011, although the minds behind the show took the season off last year due to an aborted look for a permanent home, and now they’re back with a new spectacle that lives up to their deservedly high regard in the L.A. scream scene. It can be very difficult to get across what exactly goes on at a performance of Delusion to anyone who hasn’t experienced it for themselves, but in essence it is a highly-interactive horror-themed play. 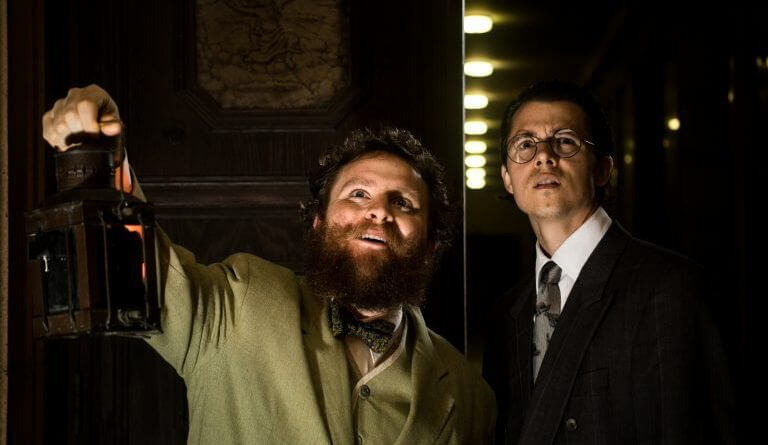 This play, however, doesn’t take place on a stage in a theater, but rather throughout a large mansion in L.A.’s historic West Adams district. Guests become part of the story, take on their own roles, and follow the action as it weaves through the expansive house’s many rooms. Photo by Nick Agro. Copyright 2016 Orange County Register. 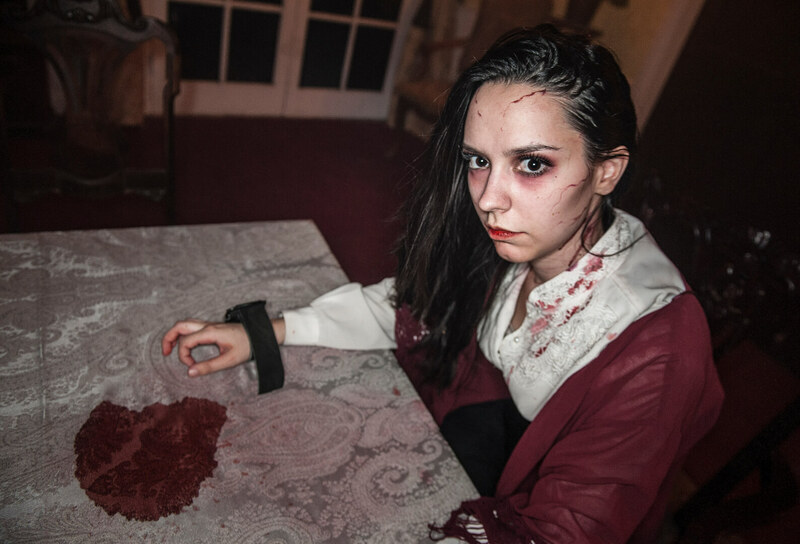 Delusion features incredibly impressive practical effects and unforgettable visual setpieces that unfold right before your eyes, and the adventure that awaits you within the mansion truly makes you feel as though you are a character in a movie. The actors are superb, the costume design and set decoration are meticulous in their design and perversely gorgeous, and the writing is evocative of the absolute best in Gothic horror fiction. Because Delusion is so difficult to describe well, the only true way I can do it justice is by recommending that you find a way to take part. That alone can be a challenging task, as the show has been sold out for the entire season since the day tickets went on sale. Fortunately, performances are occasionally added to the schedule, and there is a rumored extension in the works, so your best bet is to pay close attention to the official website. The second unbelievably impressive Halloween event I want to tell you about today is “Wicked Lit,” which falls into the same broad category of immersive theater as Delusion, but goes about the process in a very different (but equally rewarding) way. Instead of telling just one story, Wicked Lit is a collection of three horror tales from the public domain, each performed in and around the humongous Mountain View Mausoleum in Altadena. The three macabre plays are tied together by a humorous interstitial “lobby” performance, which welcomes guests as visiting family members to the fictional Camp Mountain View, a tongue-in-cheek Addams-Family-esque ghoulish take on the traditional American summer camp. The audience is then split into three separate groups, each of which take in the production’s individual plays in a different order. Photo by Daniel Kitayama. Copyright 2016 Unbound Productions. This year’s selection at Wicked Lit includes a traditional African folktale incorporating a series of remarkable puppets, an eerie adaptation of an H.P. Lovecraft yarn, and a very dark and foreboding short story by acclaimed novelist Ellen Glasgow. Like Delusion, each scene of each story takes place in a different location on the Mausoleum’s grounds and its neighboring cemetery. Audience members follow the characters from one room to the next as the stories unfold around, above, and below them. Photo by John Thvedt. Copyright 2016 Unbound Productions. The key aspect that sets Wicked Lit apart from Delusion is the lack of interactivity. Wicked Lit is more interested in telling a story than making guests become a part of that story, but that shouldn’t be considered a detriment. It’s simply a different method of delivering an immersive experience, and it’s definitely no less effective because of it. Tickets for Wicked Lit are still available at its official website. The bottom line is that both Delusion and Wicked Lit are top-of-the-line, A+ experiences that are absolutely worth your time and money, and both represent singular, exceptional experiences that stand out from the crowd in Los Angeles, during the Halloween season or otherwise. 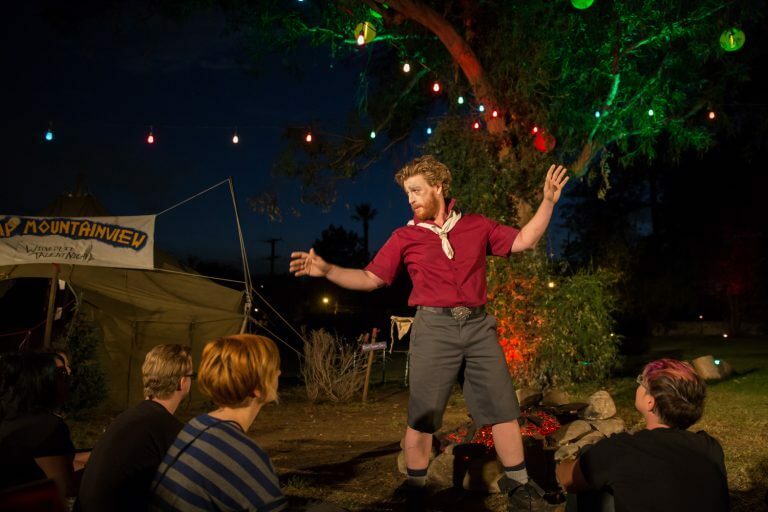 Even if you’ve never experienced an immersive theater performance before in your life, either of these would be a perfect place to start. Older Older post: 3,000 hand carved pumpkins decorate West Virginia Pumpkin House!